Chelsea loanee Victor Moses celebrated his maiden goal for Fenerbahce by paying tribute to fictional superhero Batman in the 73rd minute of the contest against Goztepe on Friday evening. Moses embarked on a solo run from just after the halfway line, making his way past a Goztepe player, then combined with Jailson, before he slotted the ball home from close range. ''The celebration is basically when Batman is on a mission, you can't see him, so that's what it is obviously,'' Moses told Fenerbahce TV. The former Nigeria international is targeting more goals after opening his goalscoring account for the Yellow Canaries. ''Hopefully more to come, as I said it's all about the team, if we keep playing good like this, hopefully I'll score more goals,'' he added. 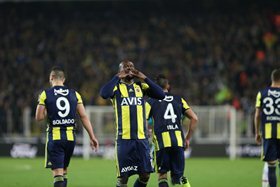 Moses is the fifth Nigerian player to score for Fenerbahce, following in the footsteps of Uche Okechukwu, Austin Okocha, Emmanuel Emenike and Joseph Yobo.